NEW YORK (CNNMoney) -- Sure, packs of T-shirts and socks are getting expensive because of skyrocketing cotton prices. Guess what else is made of cotton? The dollar bill in your wallet. In 2010, the cost of making one note jumped 50% from what it cost the government in 2008. The government produced 6.4 billion new currency notes last year. Each one cost 9.6 cents to produce, including the cost of paper and printing. In 2008, it only cost 6.4 cents a note, a tiny bit more than it did in 2007, according to the U.S. Bureau of Engraving and Printing. With the price of raw cotton at a 140-year high, things could get worse. 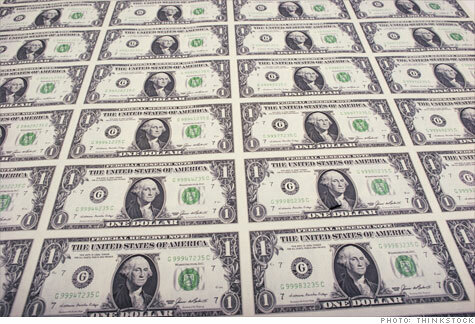 It's unclear for now how much more it might cost the U.S. to make dollar bills. However the U.S. Government Accountability Office said paper costs "are a significant portion of the cost of producing $1 notes, but less than half the total cost." The U.S. buys its currency paper from Massachusetts-based Crane & Company. Crane declined to comment on the story, citing the paper product as "strategic material." Just last week, the GAO called for replacing the $1 paper bill with a $1 coin, saying that the coins are more durable and do not need to be replaced as often. The GAO said the switcharoo could potentially save the government approximately $5.5 billion over 30 years, but didn't provide a breakdown of the cost of paper money. Correction: An earlier version of this story said the U.S. paper currency was 100% cotton. U.S. notes are 75% cotton fiber and 25% linen. Linen is derived from flax.